The 1997 Happy Holiday Barbie marked the 10th anniversary of the Happy Holidays series. This was the only brunette Barbie in the series. The blonde doll was available as a very limited edition to Barbie Collector Club members and is much rarer and more valuable than the brunette. 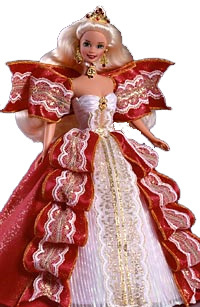 Barbie is wearing a red, white and gold down - the red ribbon accents across the shoulders look like angel wings. She is wearing a gold tiara with red stones and has gold choker and earrings - also with red stones. 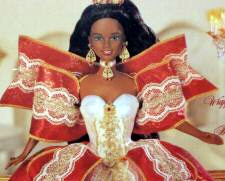 There is also an African American version of this doll. 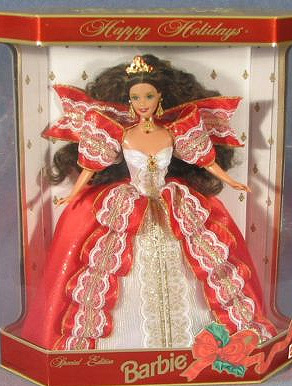 There is a matching ornament to this doll - 1997 Holiday Barbie Hallmark Ornament.